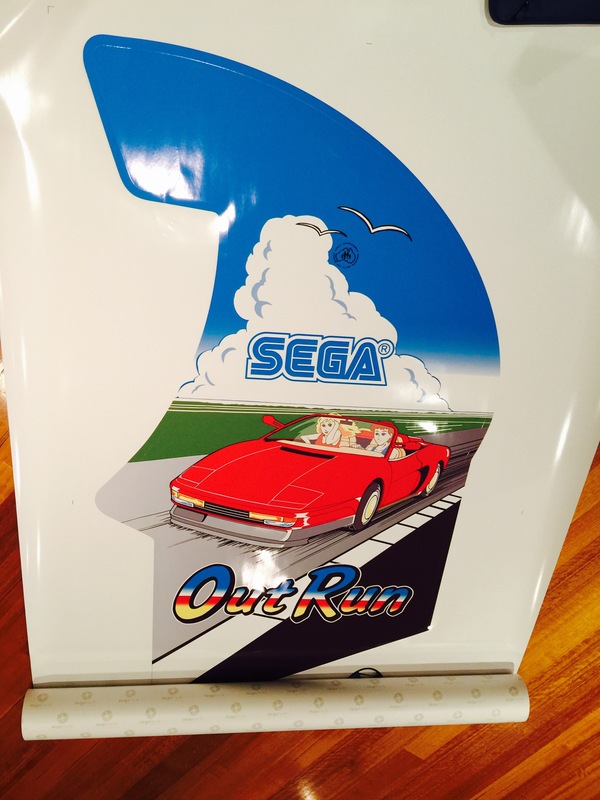 I will be using this page to do and live update of my Australian Upright OutRun restoration. I’ve been looking for a machine for several years in Australia so when the chance came I picked on up. The machine was AU$500 not working. 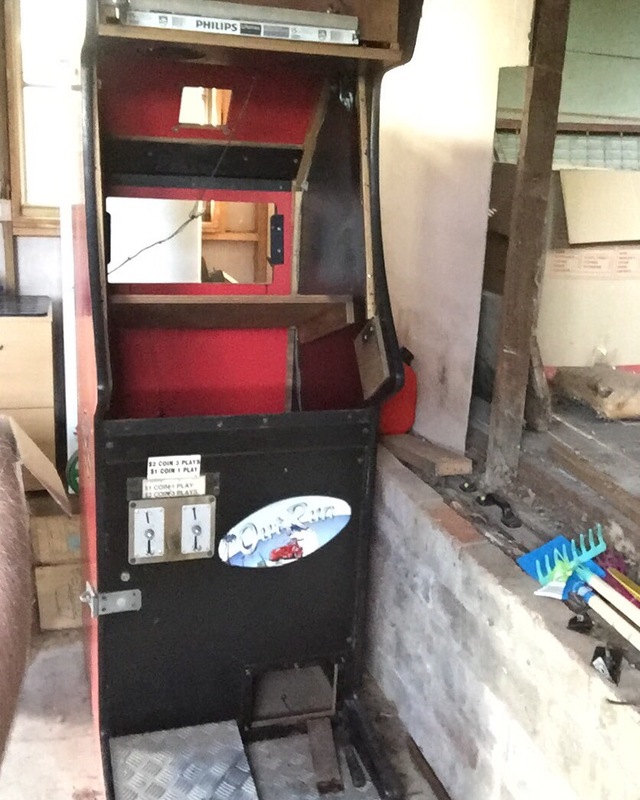 This will be me first arcade machine restoration so I’m sure their will be mistakes along the way but hopefully people looking to do the same will get something from this. The machine had two PCBs and neither worked. 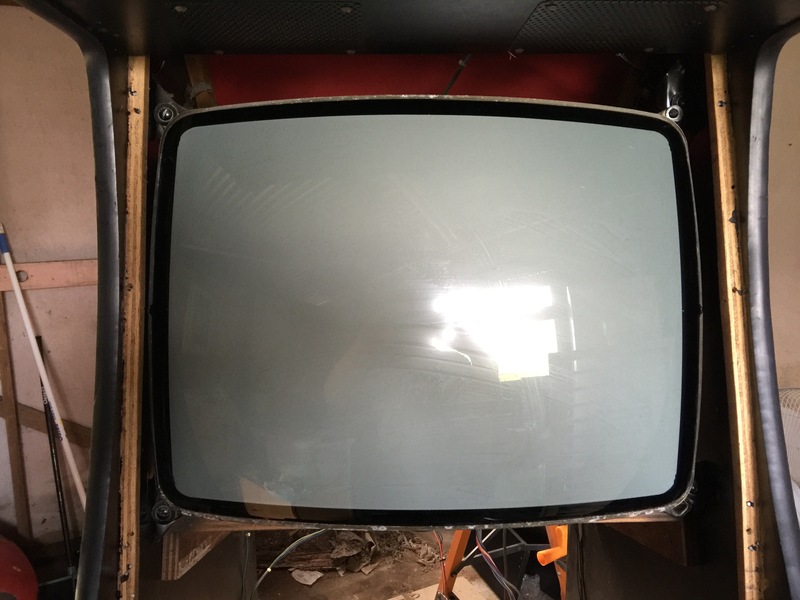 The machine also had a larger screen in it and the screen inner and outer bezel are unfortunately missing as a result of this :(. 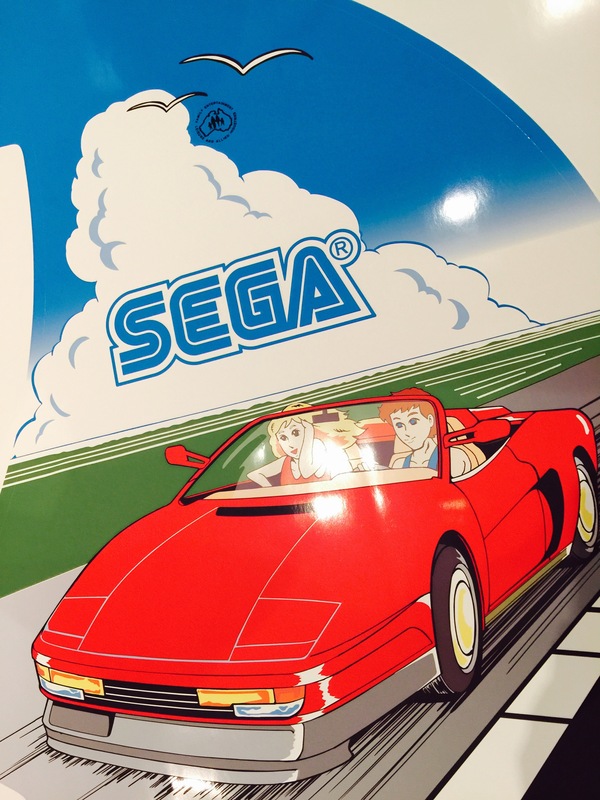 The control panel surround was butchered and probably not repairable and the steering wheel was a midway wheel not SEGA. It’s going to be a long road ahead. Operational inspection found the Accelerator pedal sticks and the steering wheel isn’t central or giving a smooth operation left to right. I spent the first few weeks just messing around with the PCBs – switching parts around between the two, cleaning the ICs but I still couldn’t get it up and running. One board showed nothing, the other I could get into test mode. I sent the boards off for repair and will give an update when I get them back. The monitor took two of us to remove as it was larger than the original and a real squeeze to get it out. It wasn’t even central in the machine. 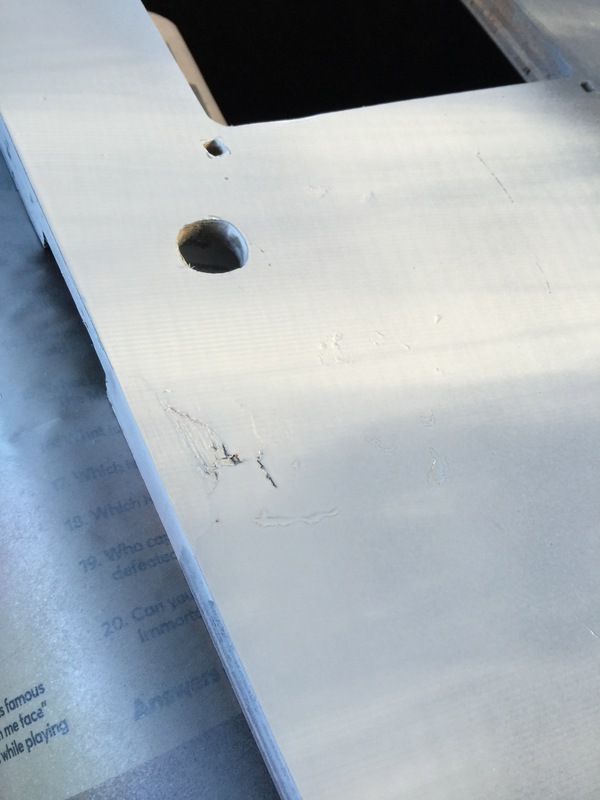 To fit this monitor holes had been drilled into the cabinet sides to add fixing brackets. These will need filling at some point. I’ve been stripping down the cabinet over the last month or so bit by bit. The control panel took some time to remove as I bagged up the parts and photographed everything along the way. It was time to see why the steering wheel didn’t feel right. 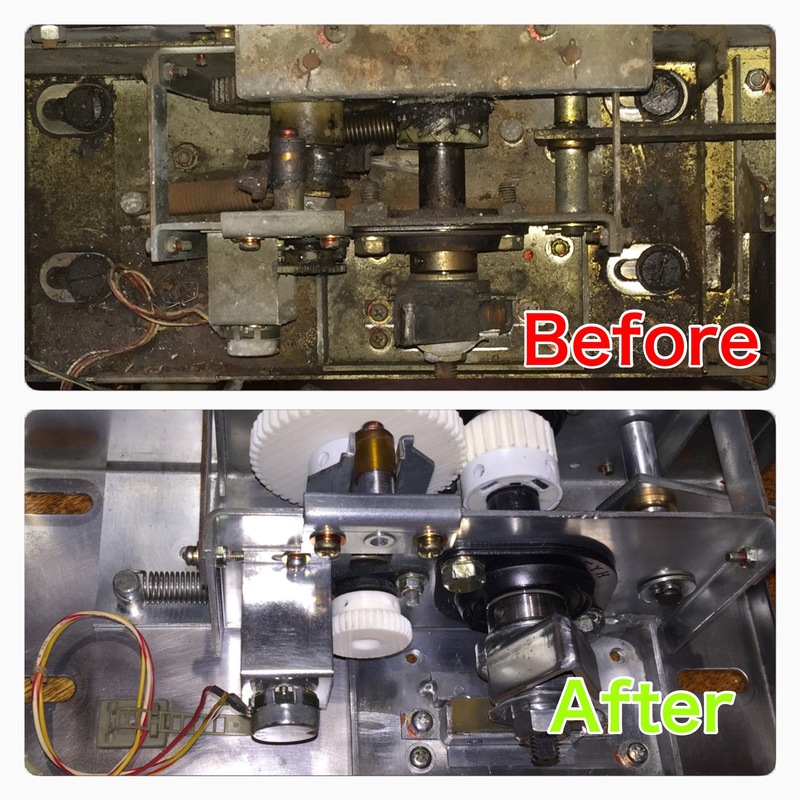 As you can see from the picture above this machine has not been cleaned or maintained for a very long time. 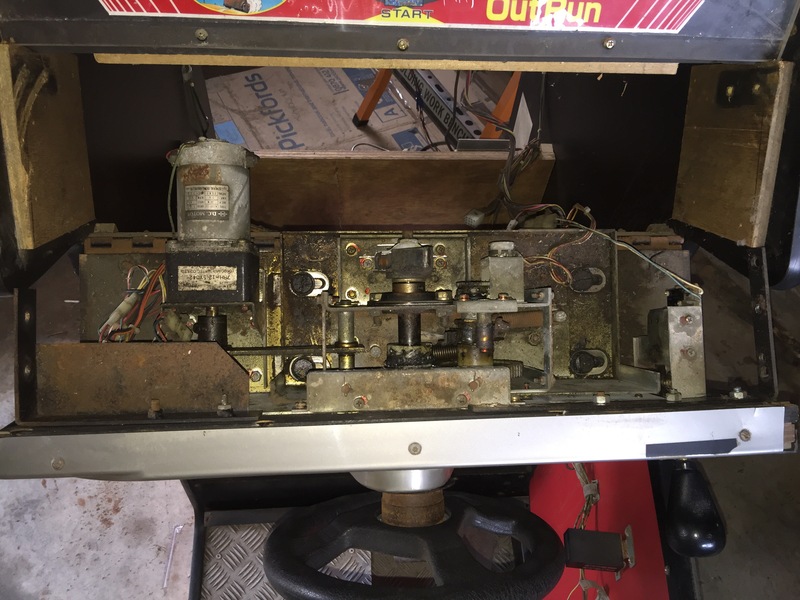 The controls were removed and their were several issues found. 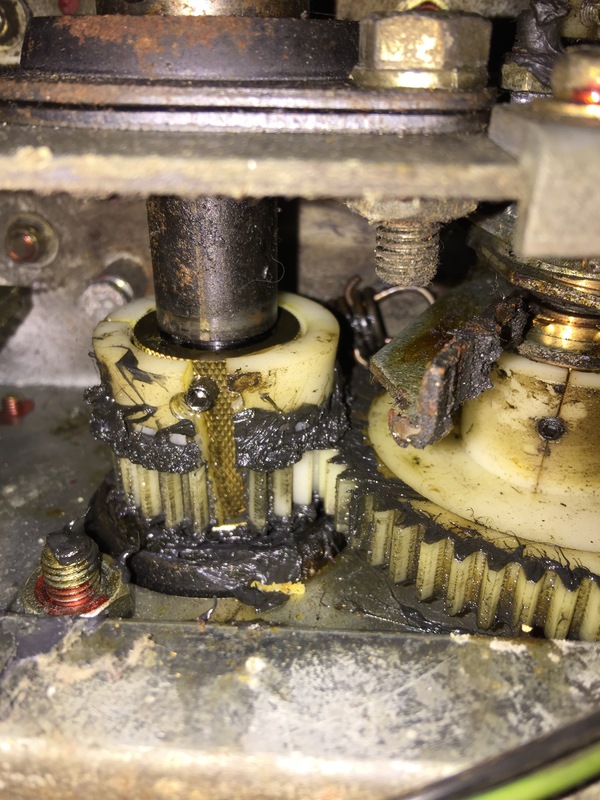 It looks like this machine has had a lot of hard use and due to poor maintenance several parts have also bent. 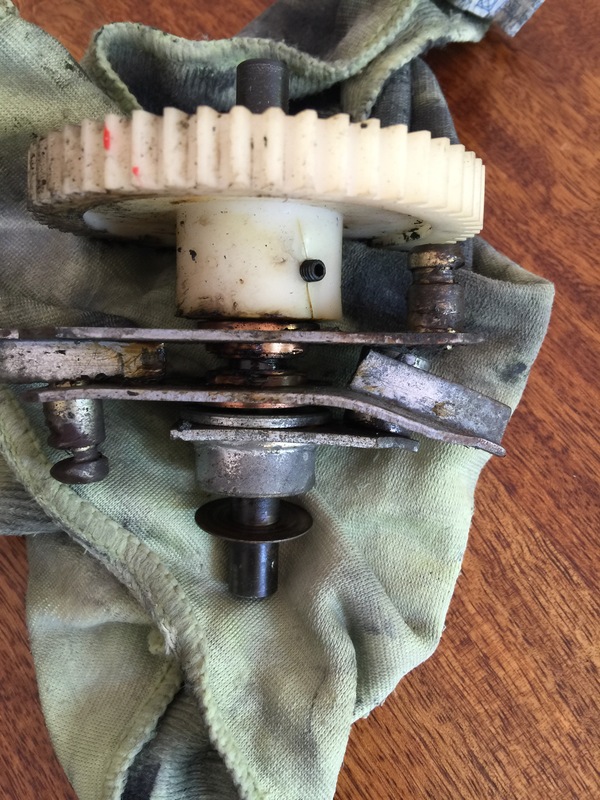 All of the steering gears are either split or cracked. 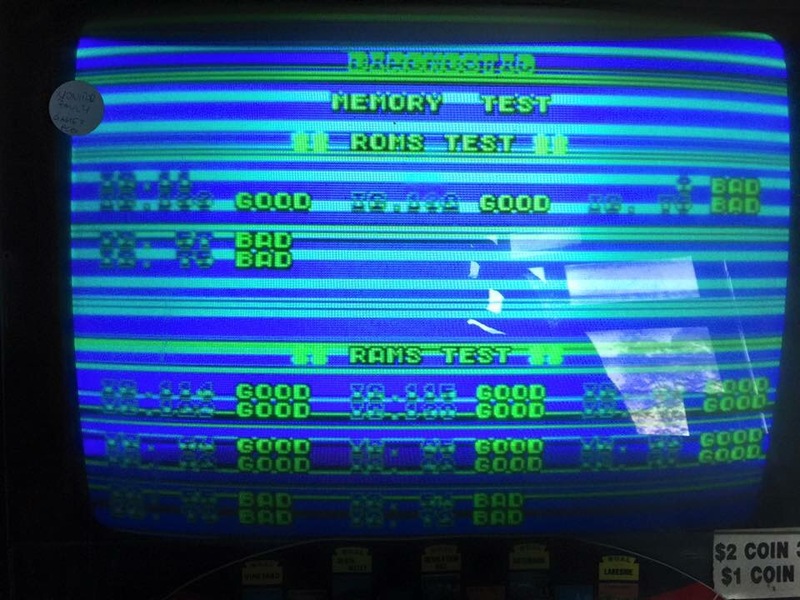 This is one of the common issues with an OutRun machine so I wasn’t surprised by this. 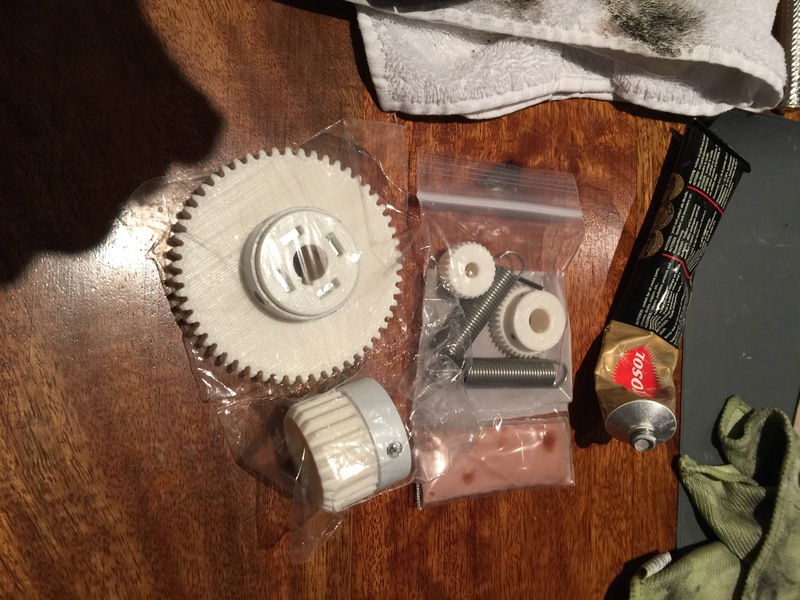 I ordered a full set of gears from a guy on eBay for under AU$100. They also came with replacement springs and grease which was a nice bonus. 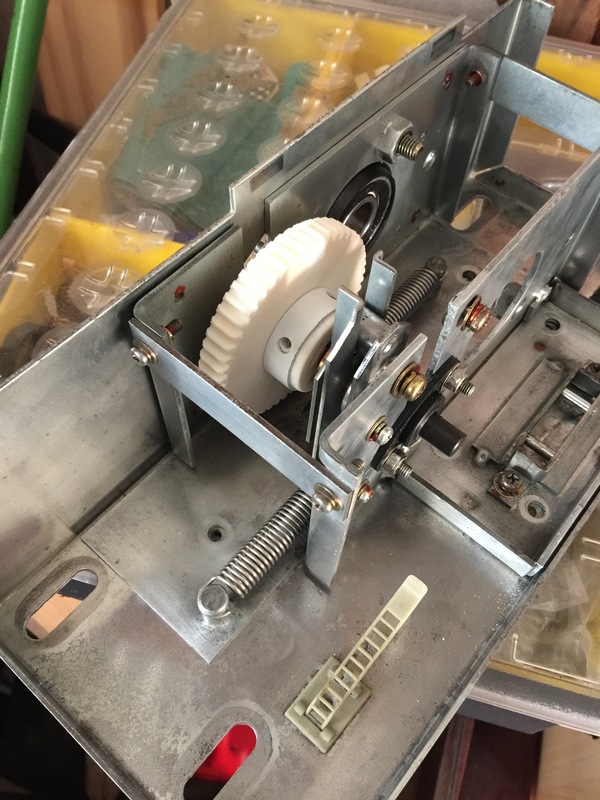 Before fitting the gears I wanted to give the whole control mechanism a good clean up so I removed the electronics and shaker motor first and blasted the hell out of it. Doing this got rid of a fair bit of gunk but it was nowhere near grease free. 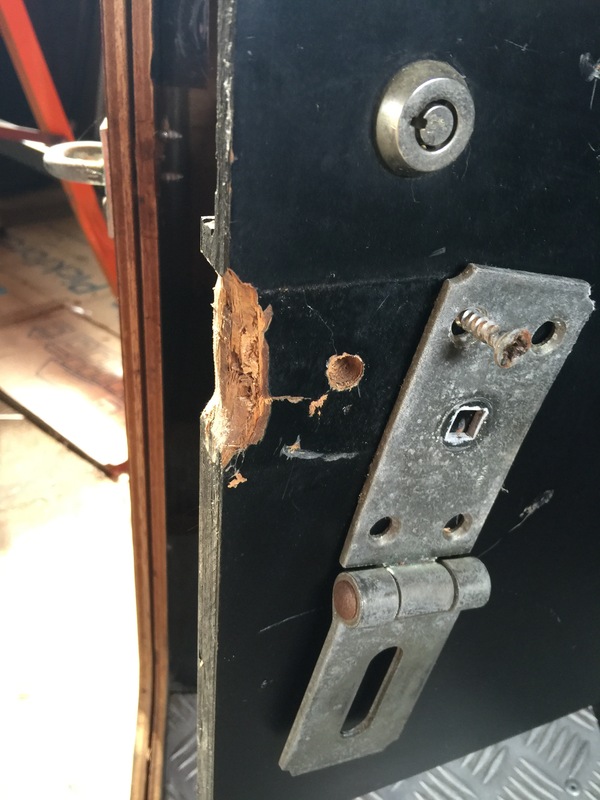 I started to strip it down further and came across more issues. 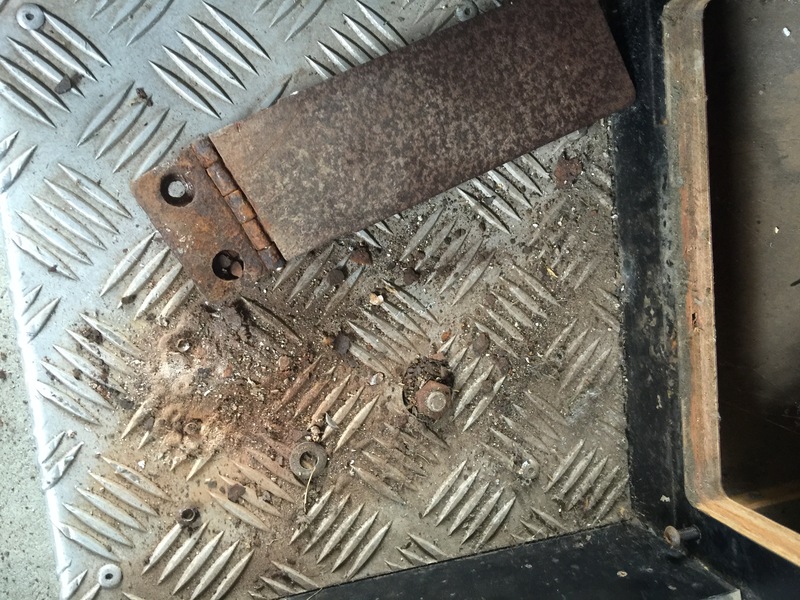 The bumper plate that stops the steering wheel travel had two broken welds. 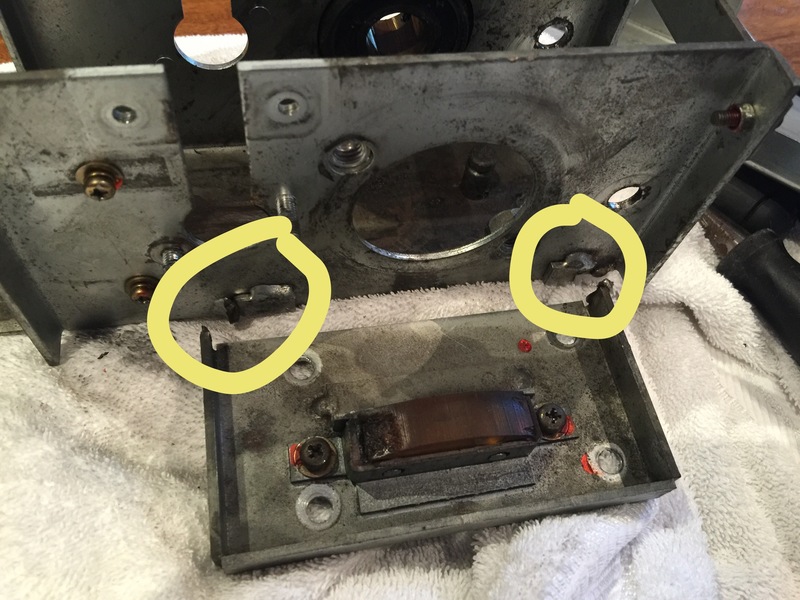 After removing these and the B gear I found the shaft that they go on was also worn down and no longer level/straight. 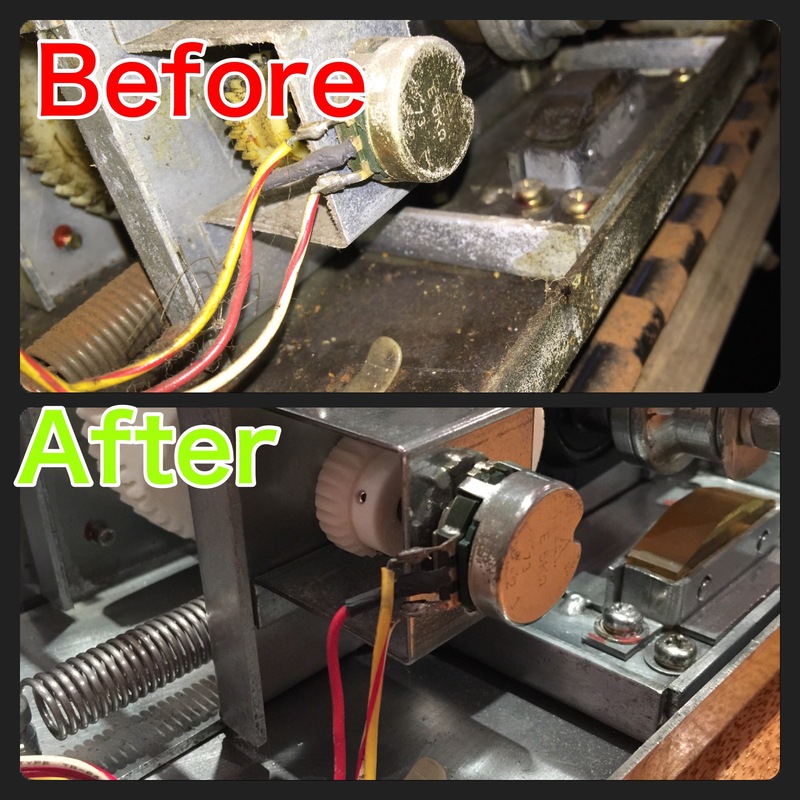 Realising that the shaft and worn pins were beyond repair I placed an order with ArcadeFixIt. I picked up the gear shaft, both steering arms/pins, gear shift plate (this was split on mine), resin steering stopper and OutRun steering wheel cap. 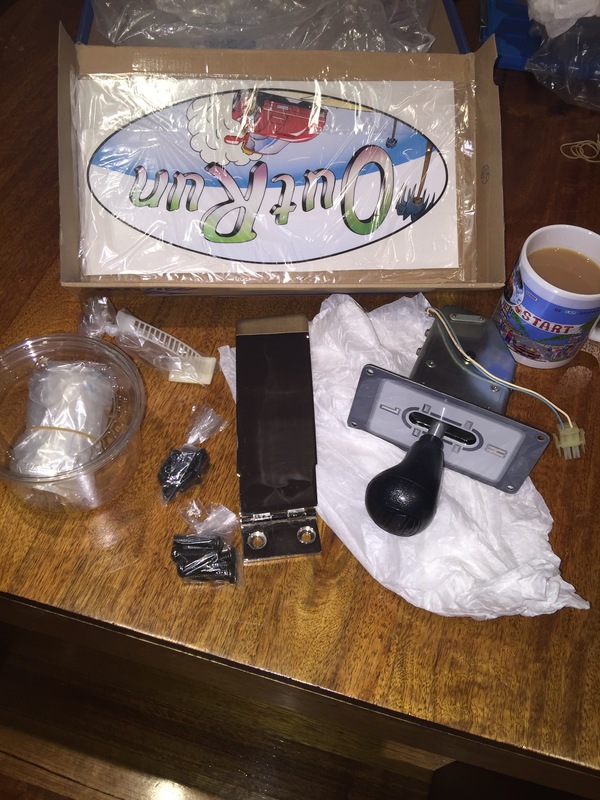 These are all original NOS parts. I also picked up the below from eBay and the service was very good on both accounts. The gears above are a full set. 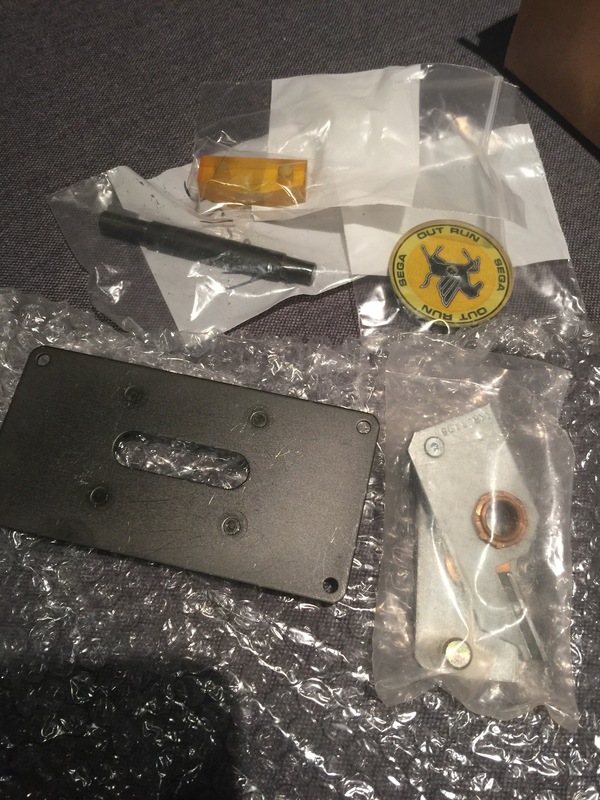 They came with Allen keys, steering springs and grease for AU$100 which is a good price compared to other sources. I’m currently in the process of cleaning metalwork. 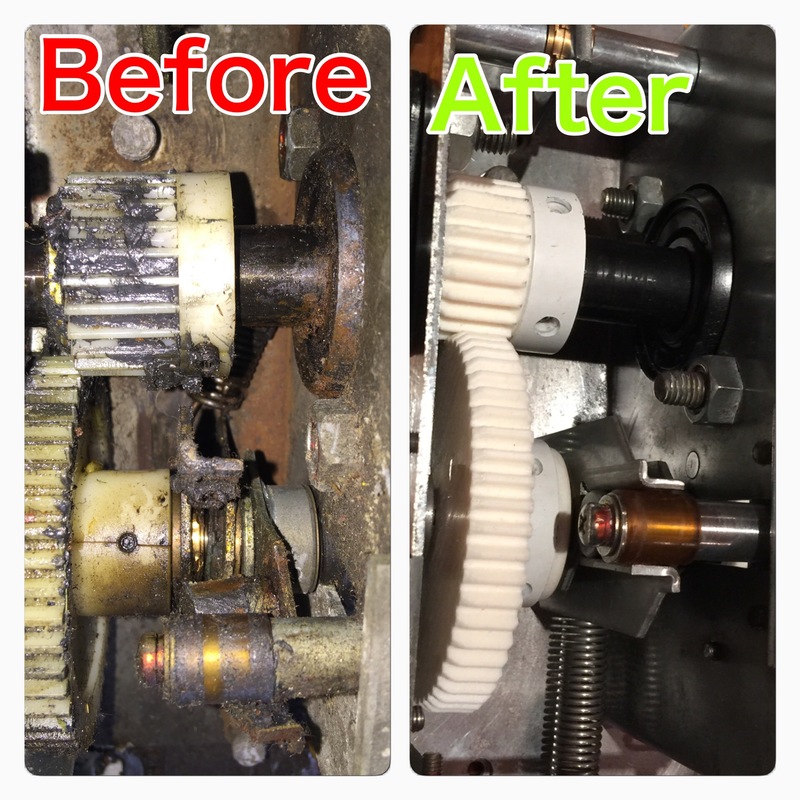 Here’s a before and after of the main steering housing. I used a scouring pad and soap then buffed it with metal polish. 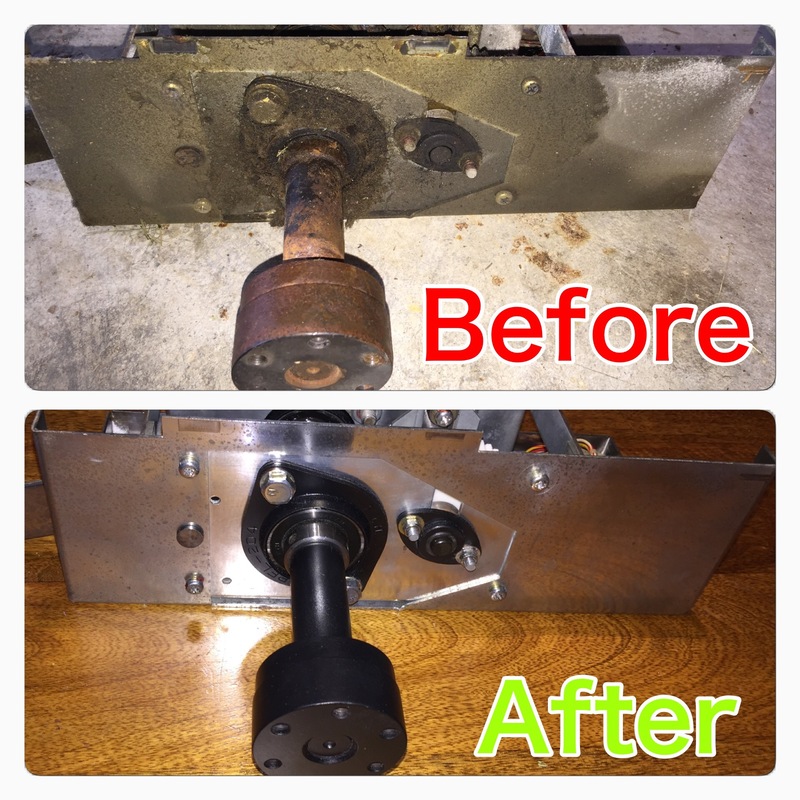 I’ve started to rebuild the steering mech with the parts that I cleaned or purchase recently. It’s starting to take shape and is so much better than it was when I picked it up. 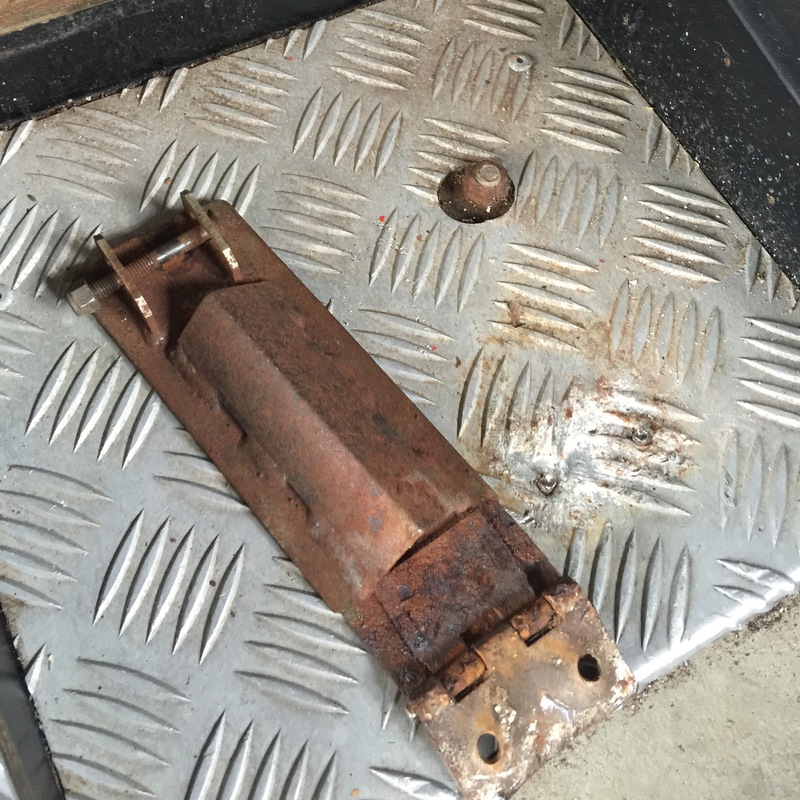 Today I continued where I left off at Christmas with trying to remove the old rusty accelerator pedal. I picked up a steel drill bit a few months back after snapping two over Christmas. Using the drill, a chisel and a metal mallet its finally come away. Crack the Champaign! 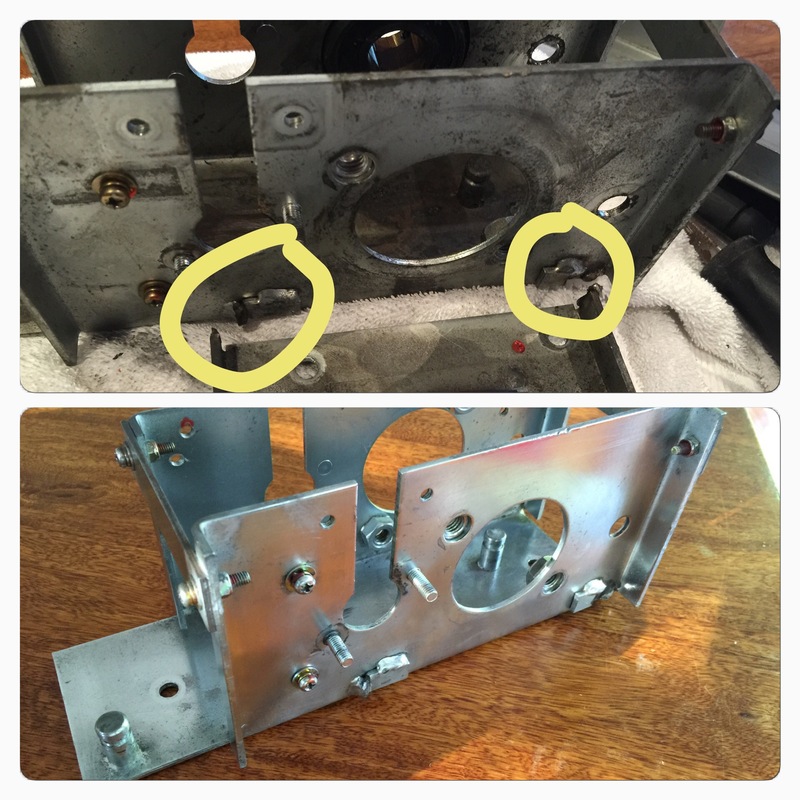 The two threaded bolts are still in place though and pliers won’t budge them. I think I’m going to have to remove the checker plate and then have another go at a later date. 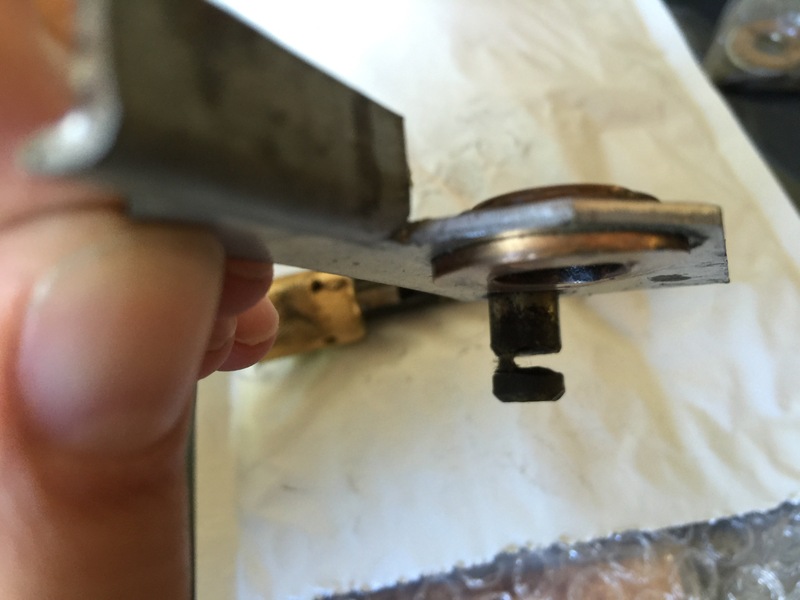 I removed the checker plate by hamming and chilsing the rivets holding it in place. 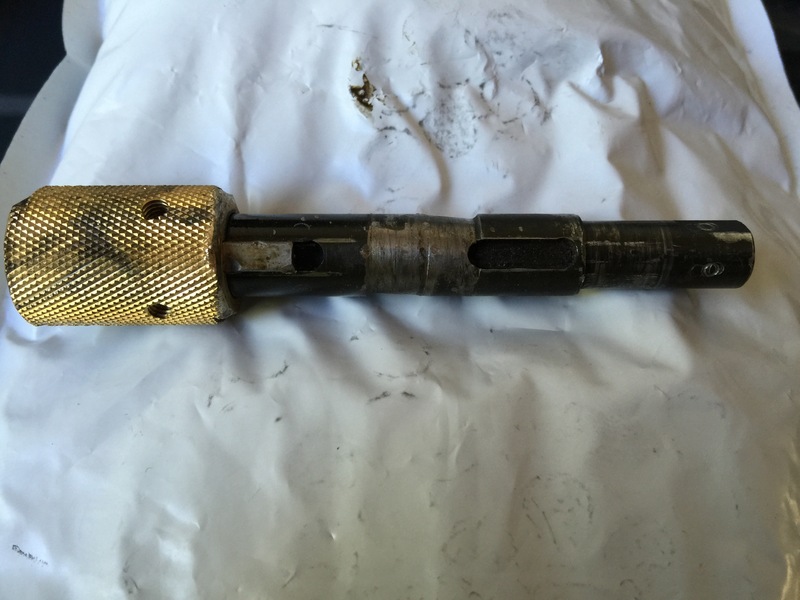 This allowed me to hammer out the old accelerator bolts. Result! 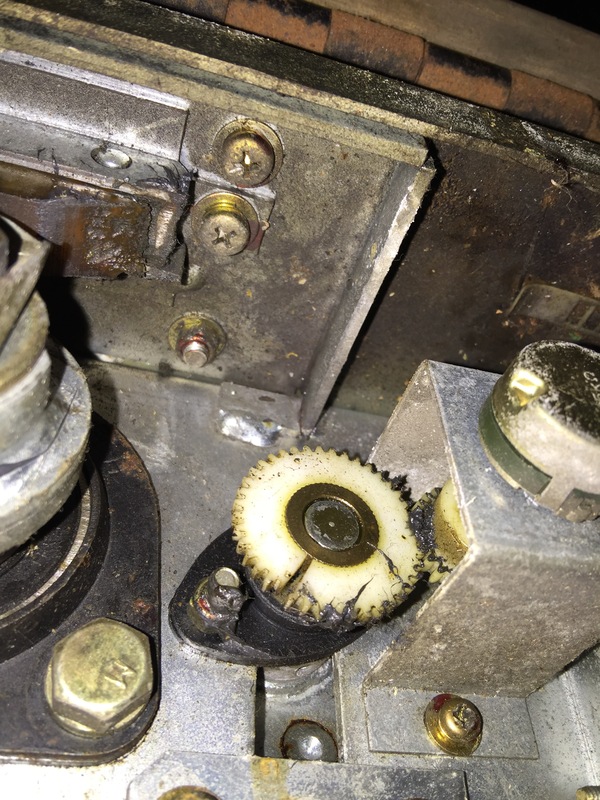 The remaining wire harness was removed from the machine and the other checker plate. At this stage I will have a go at cleaning the checker plate but I may end up replacing it. The cabinet is finally empty! 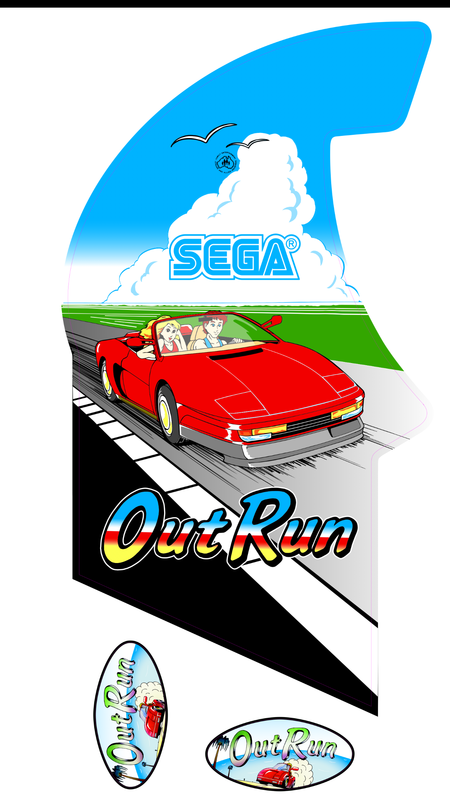 I’ve also received from a graphic designer redrawn side art. As it was for just for personal use and not for business he did the work for free, so thank you Alfonso, top man. 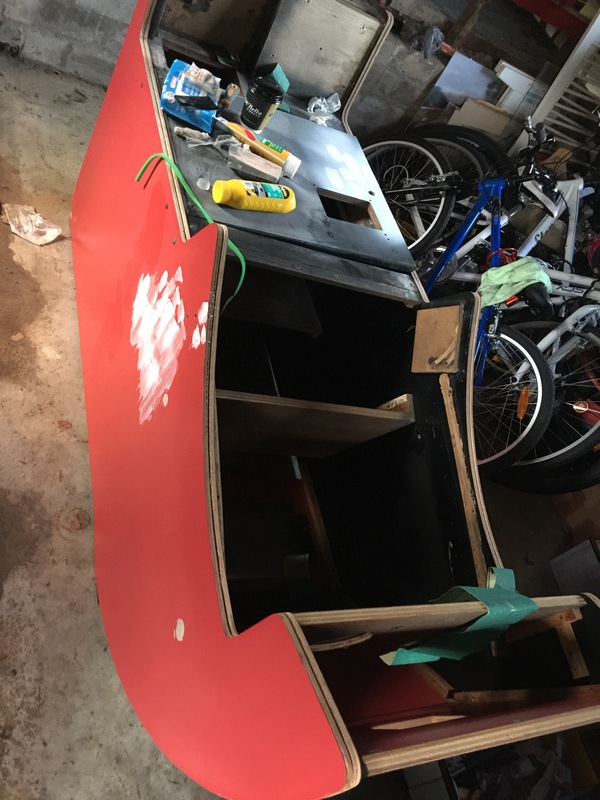 Woodwork – Over the last week I’ve had the hairdryer out….no not for my hair, to make easy work of removing what was left of the side art and front oval stickers. I then started to use putty to fill major wood damage. 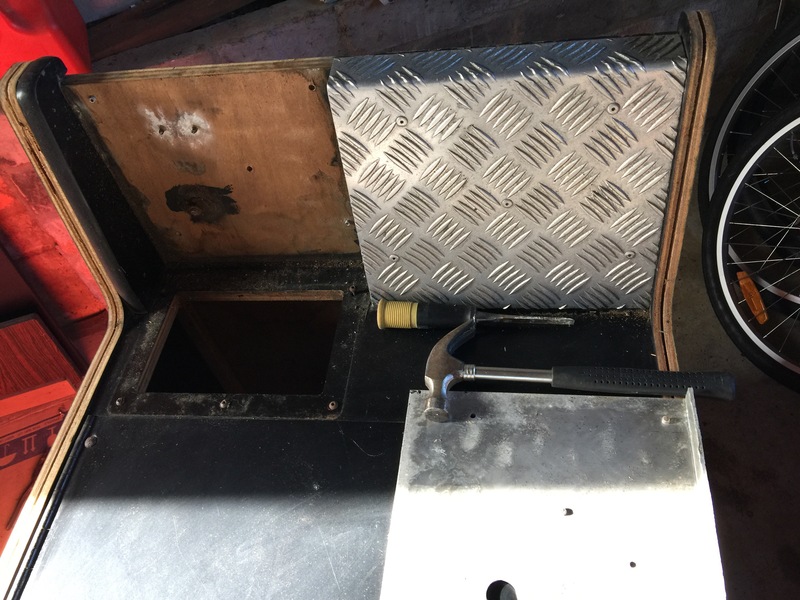 This was mainly around the front and rear access doors where previous owners had forced the rear door open and a operator had fitted a security padlock. Primer added and imperfections stand out. Refilled with fine filler some of the outstanding pressure marks and general rough edges to the cab. 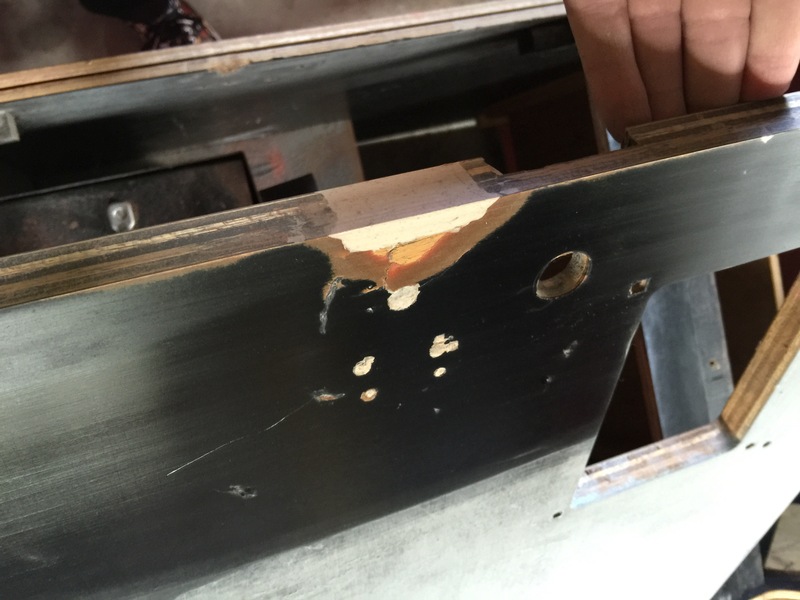 Also wood putty in some of the holes that had been previously drilled in the cab sides to hold the oversized monitor/brackets in place. May get to sand these tomorrow . 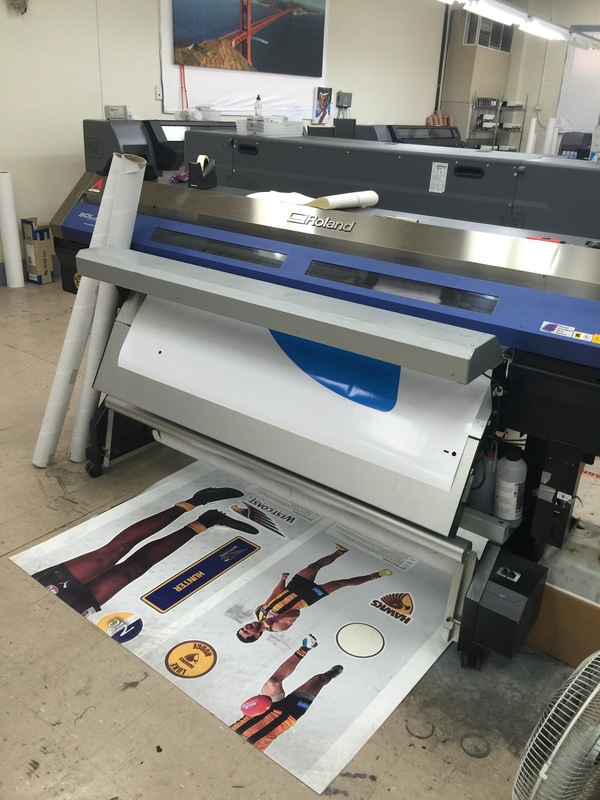 Other news, I spent some time at the printers yesterday and watched the side art get printed. Here’s the finished product including the added Australian LAI logo and rear curve. 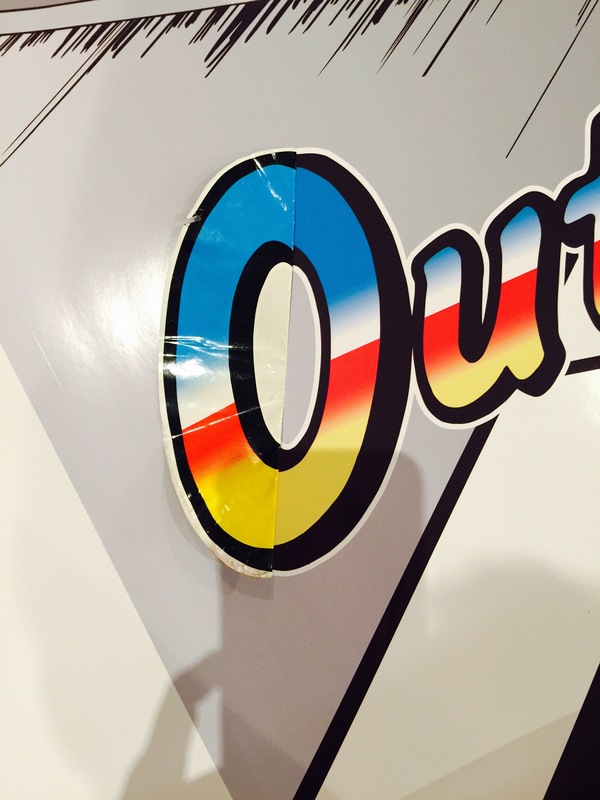 It took twenty minutes to print one side and a couple of minutes to kiss cut the shape. Hopefully the cabinet repair work and painting will be completed in the next few months.